In this section describes the manufacturing the wooden stairs to order. 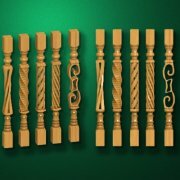 In addition, the subcatalogs include the produced by our company carved stair elements - carved entrance pillars, carved corner and starting posts, balusters, balustrades, carved decorative tops of the pillars, wood stair railings. A wooden staircase, whether it is a cozy country house, whether it is the spacious cottage has always been a major element of the architectural design. Our company produces a range of carved wood products, allowing for the presence of even small skills in joinery to assemble in the house a stylish carved wood stair. In this section of the website presents the carved decorative elements that uses for construction of stairs of wood. Produced carved balusters, carved railings and stylish carved entrance pillars and pillars tops will allow you to effectively make the wooden stair, which no doubt will eventually become the main decoration of the house. We offer carved items of wooden stairs which are made from hard wood with beautiful texture. This beautiful and delicate texture will surely attract the most attention. We can offer any options, and also to design and produce custom stairs any complexity. Also custom we produce the items for carved wooden stairs as on the finished model, proposed from our catalogue and your special requests. The Art-studio "3D.style" accepts orders for the design, fabrication and installation of stairs made of wood with unique carved items carved pillars, balusters, tops, etc. Our manufacturing capabilities allow us to make the staircase unique-beautiful with the use of technologies of wood carving on high-precision five-axis CNC large format. If you have a ready design project, but required the production of carved items to a ladder, then describe your needs in the order form. We will discuss options and will contact you by way specified in the letter.